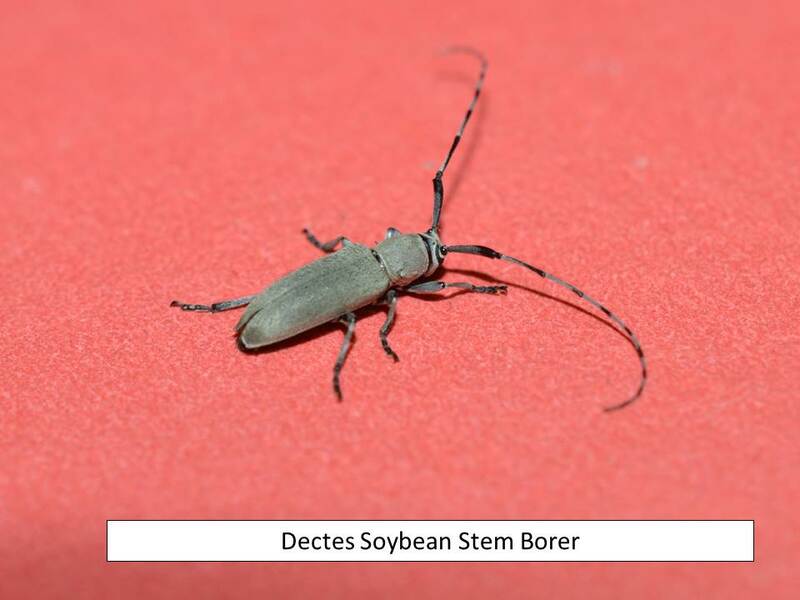 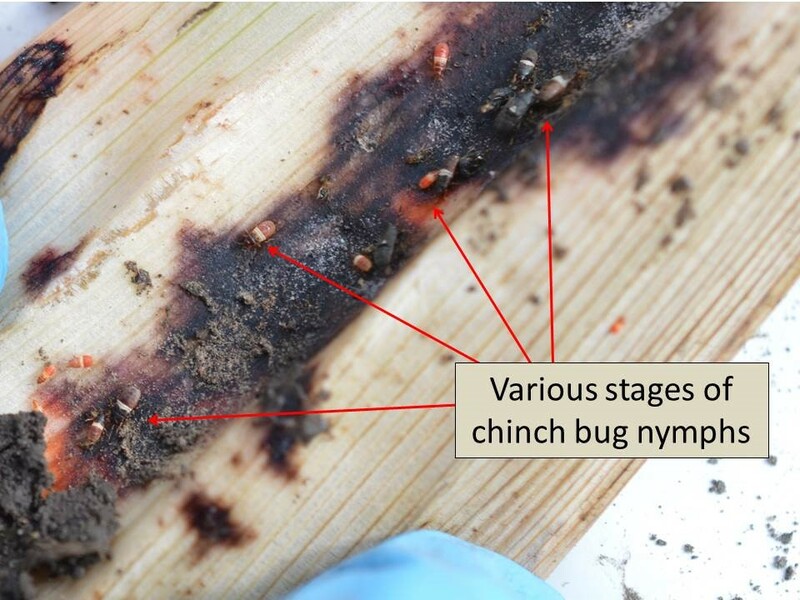 Dectes stem borer adults. 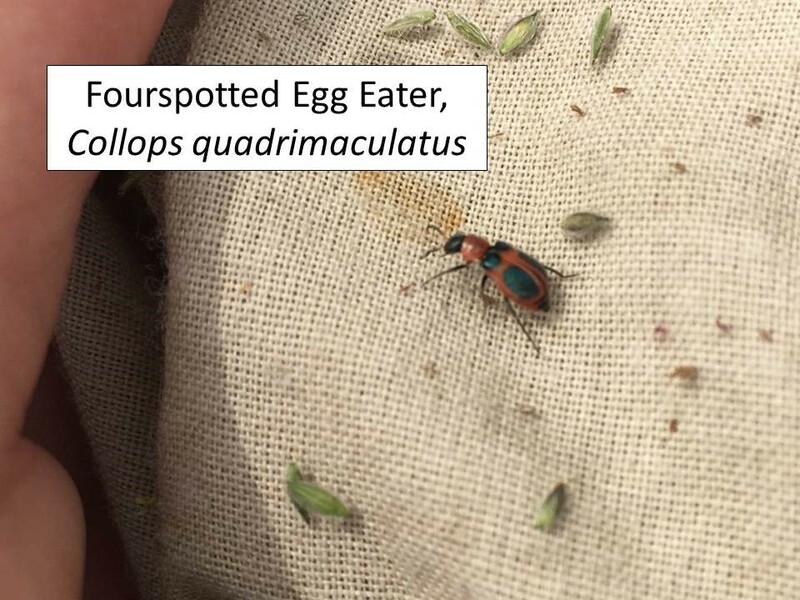 These have been actively depositing eggs in petioles for a few weeks although populations seem somewhat reduced compared to the past few years. 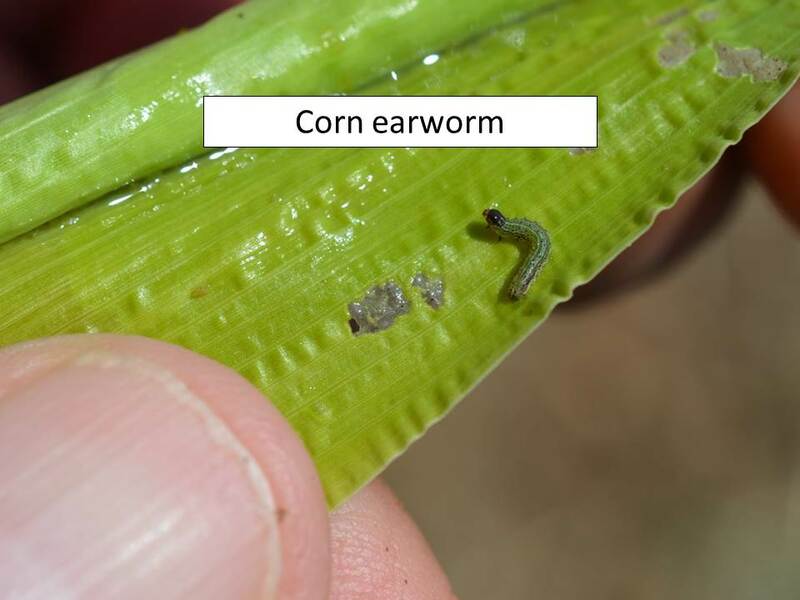 Larval tunneling within the petiole and resultant petiole death has not yet become very apparent. 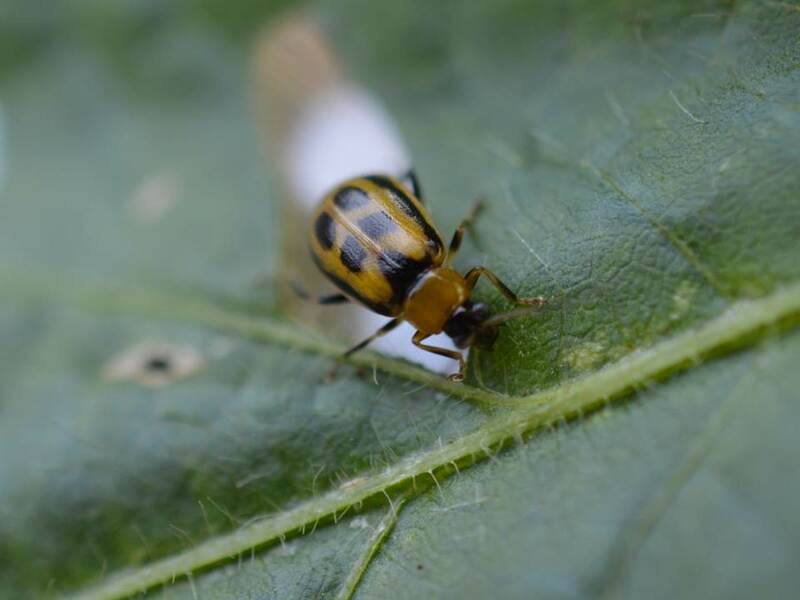 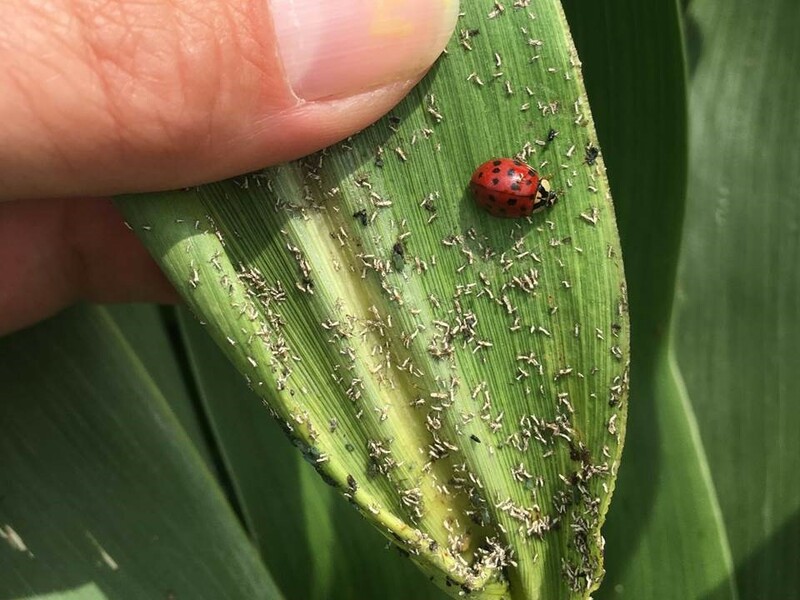 Bean leaf beetle adults. 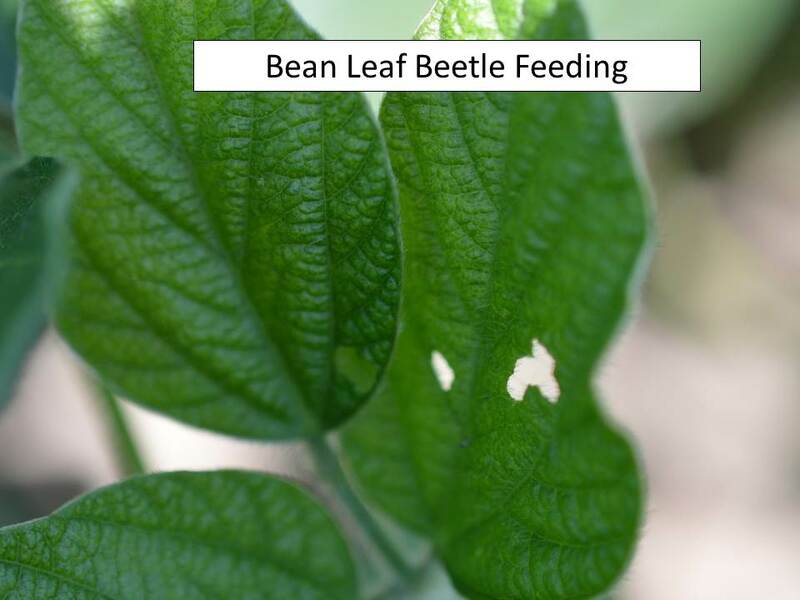 These feed on the leaves, usually causing mostly round or oblong holes, which are of little consequence. 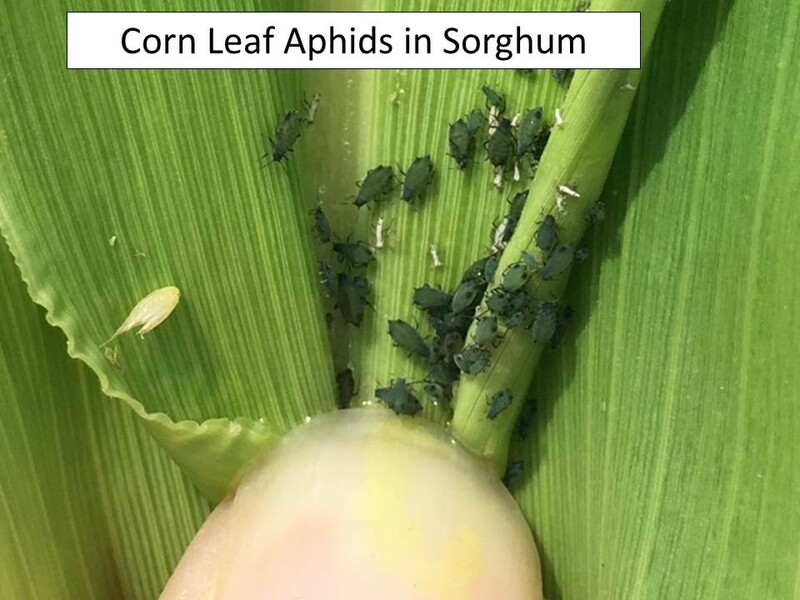 However, these same adults can also feed on the pods which may damage the bean inside and thus cause significant yield reductions. 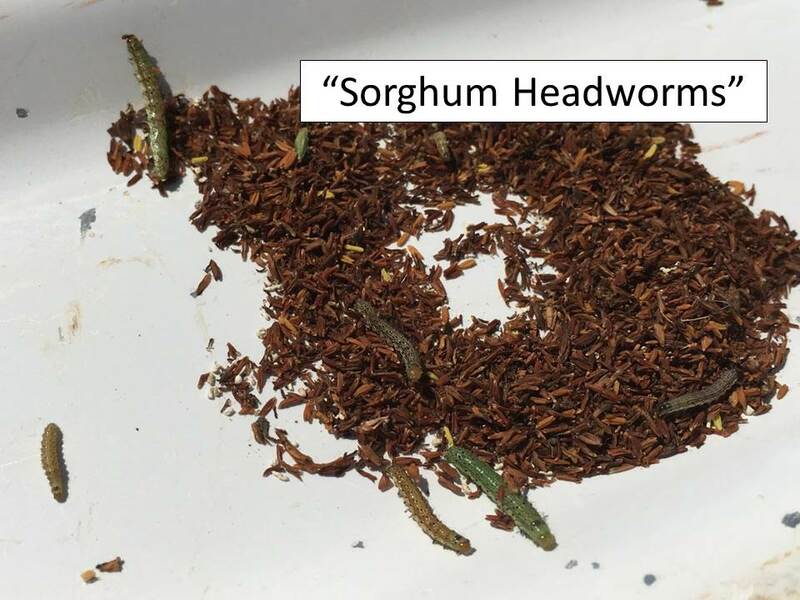 “Worms”. 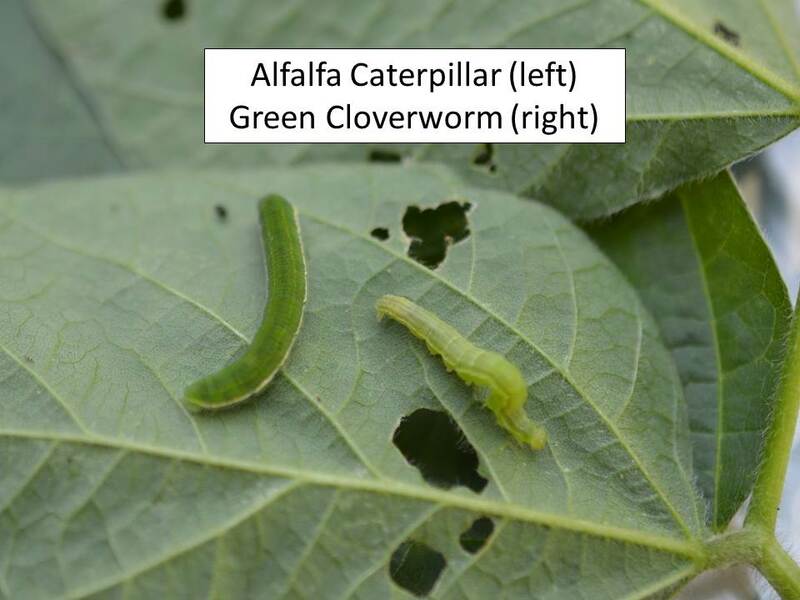 There are also significant numbers of a variety of “worms” or caterpillars in most soybean fields. 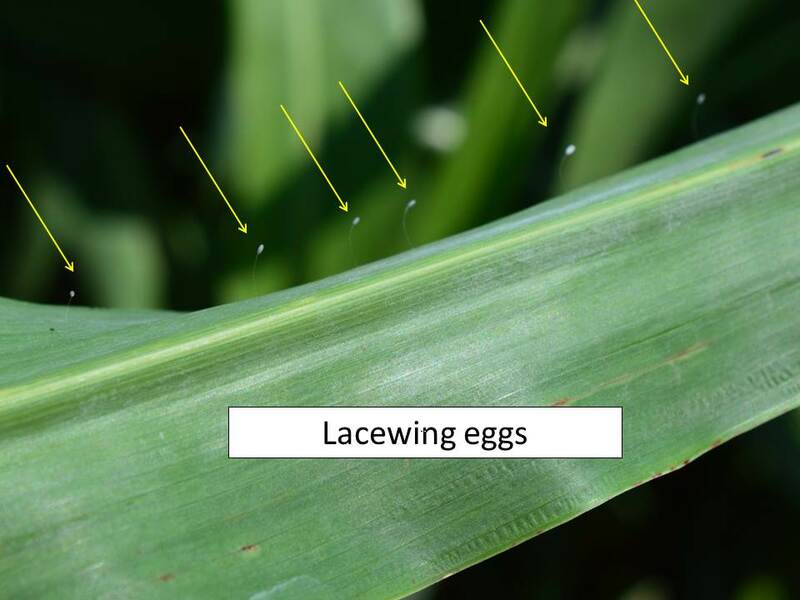 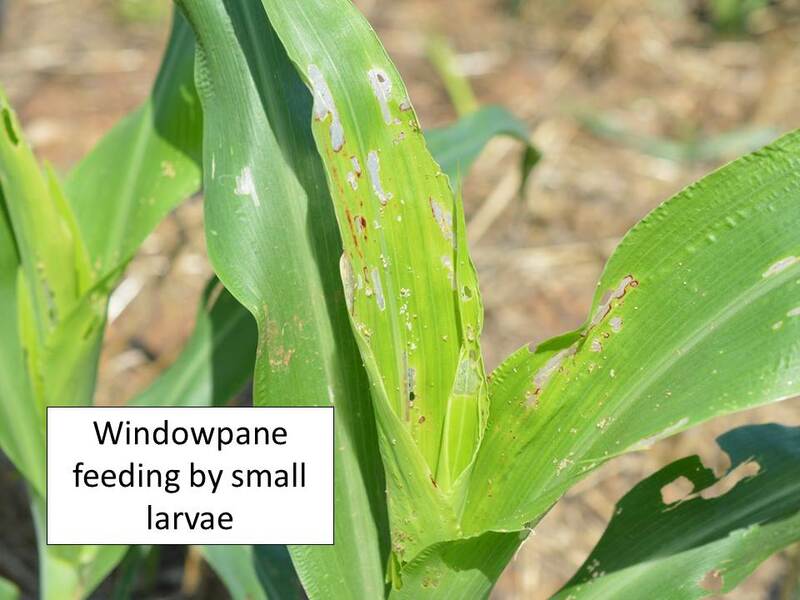 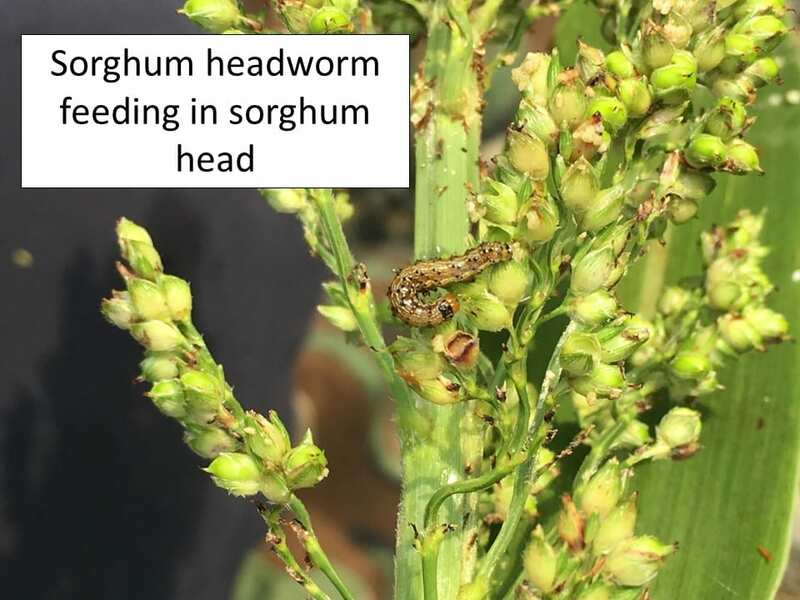 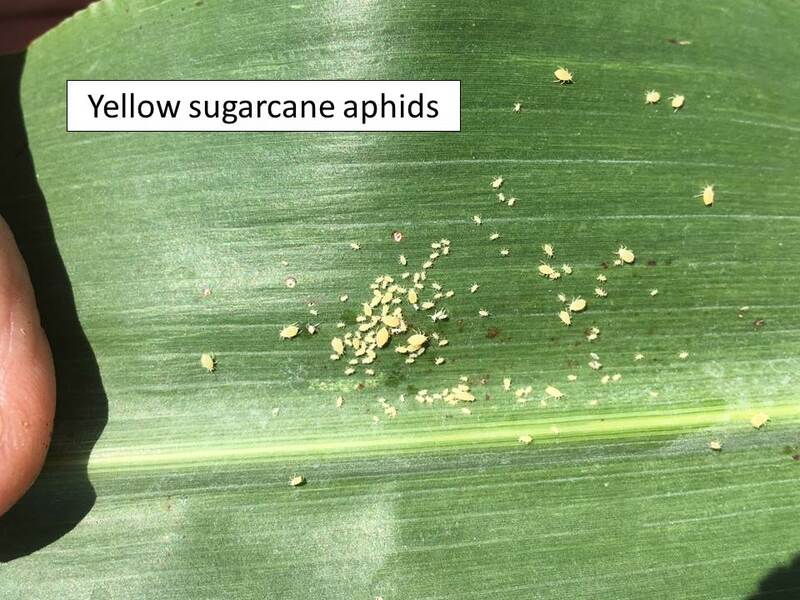 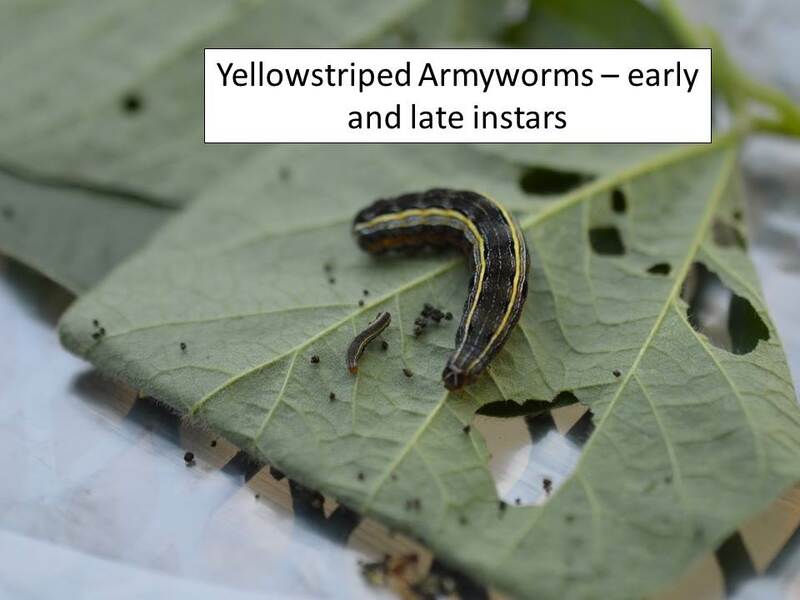 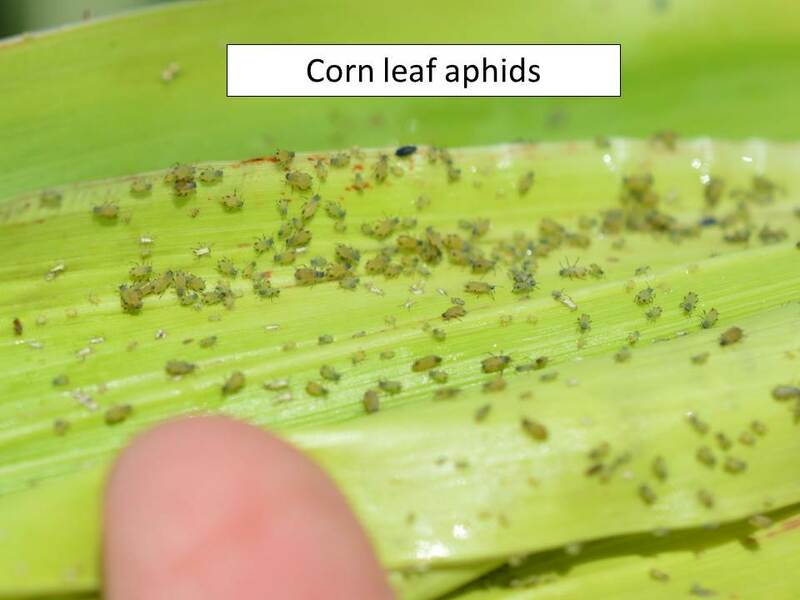 These include various stages of yellowstriped armyworms, which may feed on the leaves but not enough to impact plant health or yield. 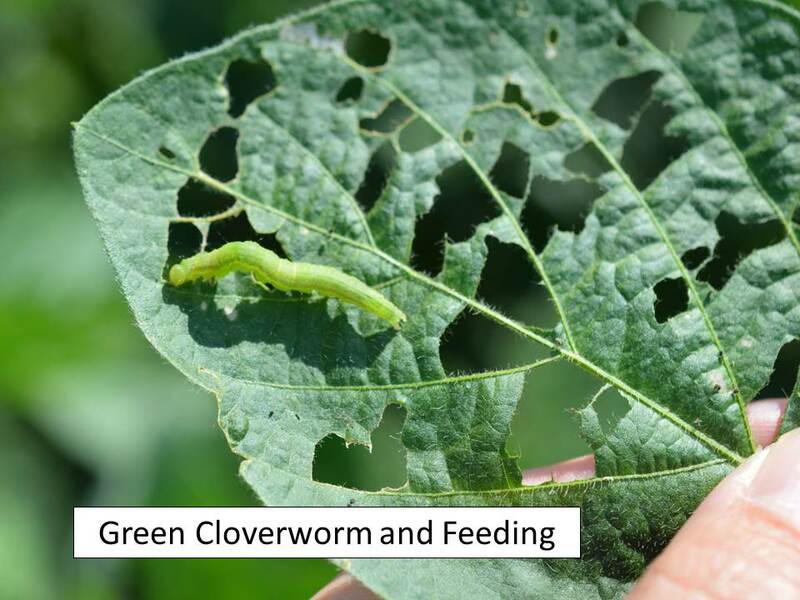 There are also numerous green cloverworms, which are also leaf feeders. 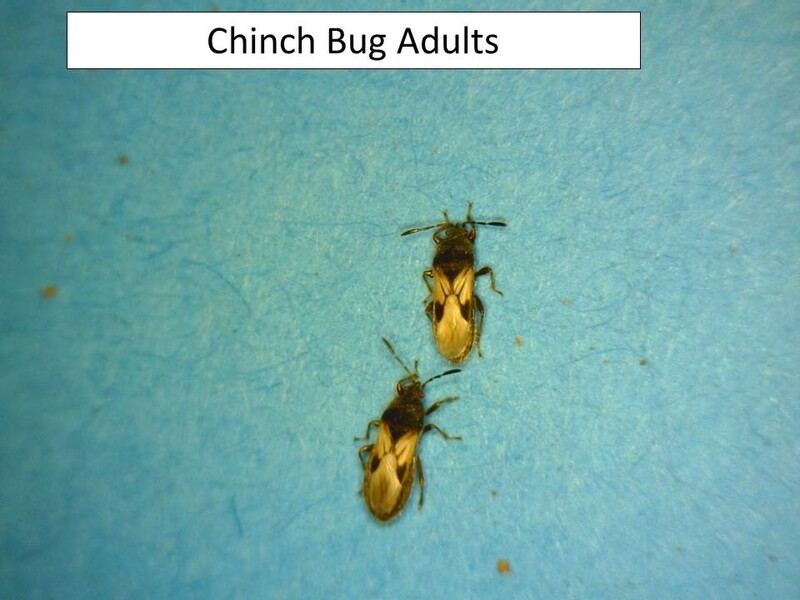 These are the “inchworms” that wiggle like crazy when disturbed. 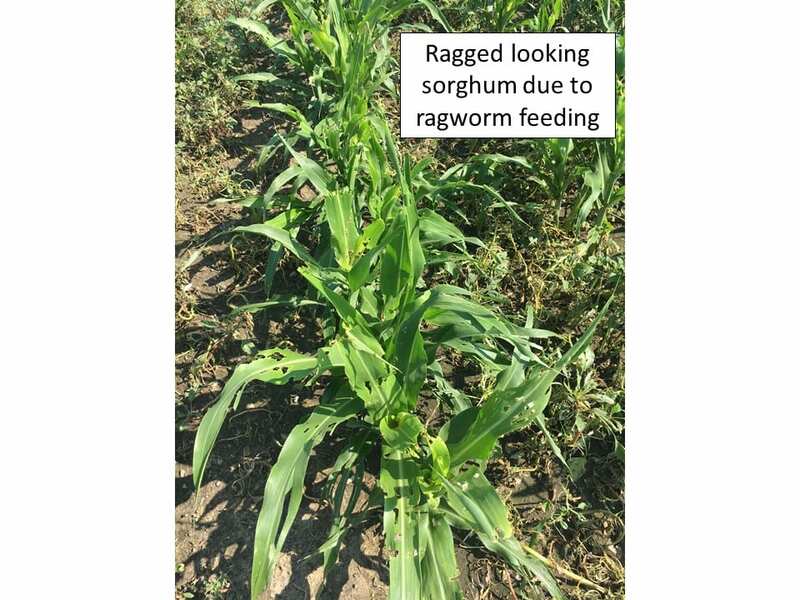 They are usually highly susceptible to a fungus that turn infected larvae white and decimates the population rapidly over large areas. 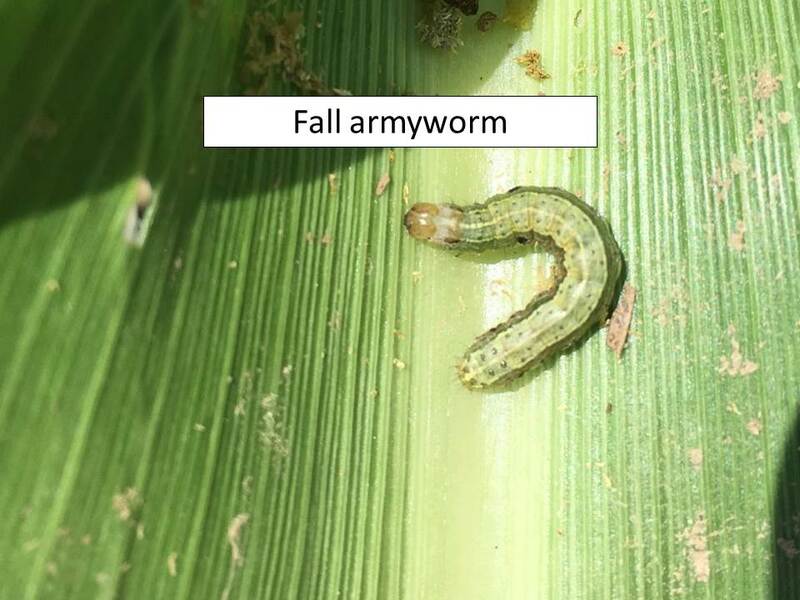 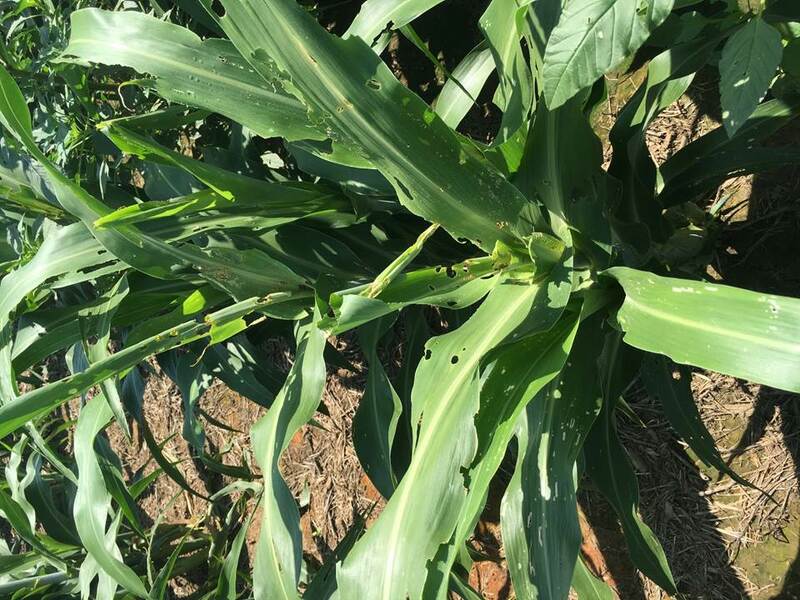 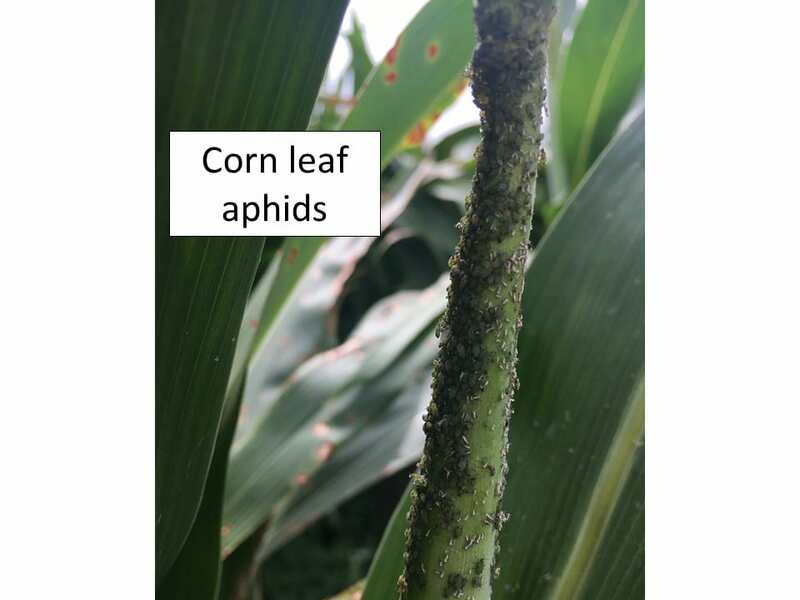 Green cloverworms may cause a great deal of concern because of the defoliation they cause, but rarely are they any real detriment to the plant. 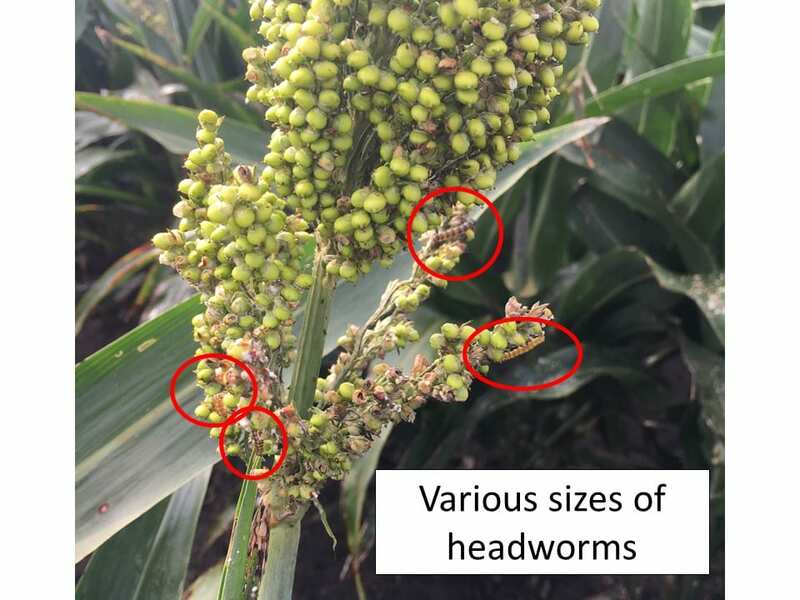 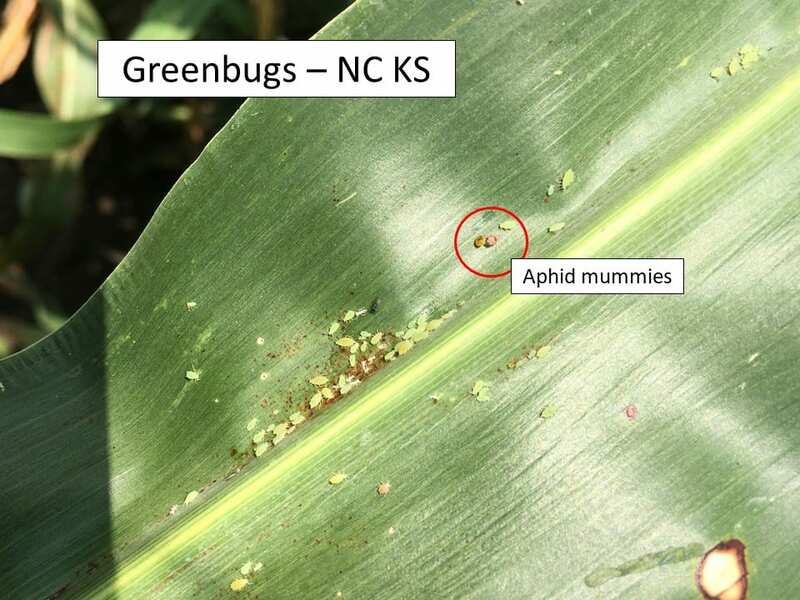 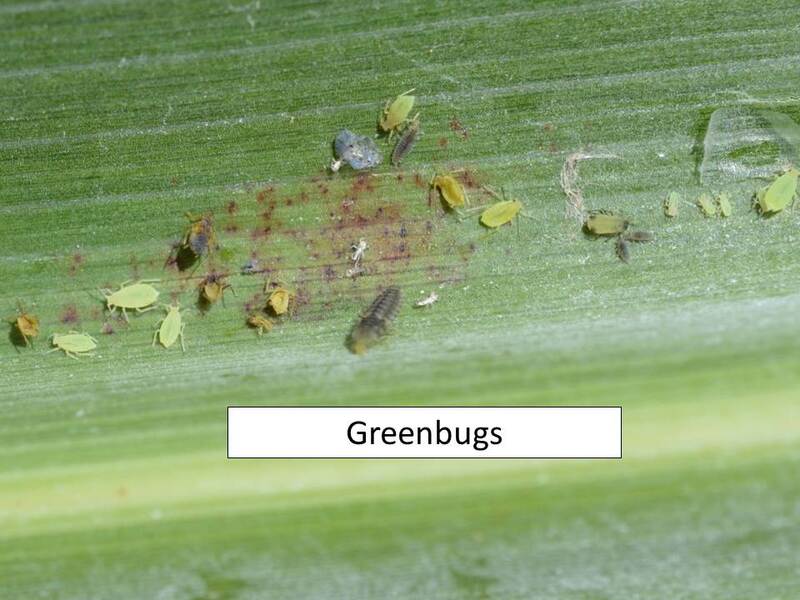 However, make sure to properly identify the worms as there are also corn earworms, aka soybean podworms, which may be mistaken for green cloverworms. 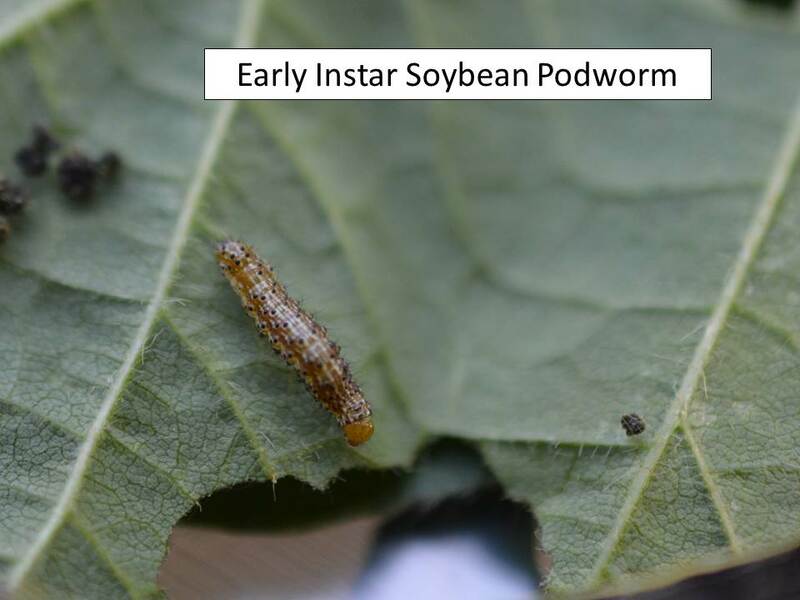 Soybean podworms will feed on leaves but more worrisome is when they start feeding on the developing seeds within the pods. 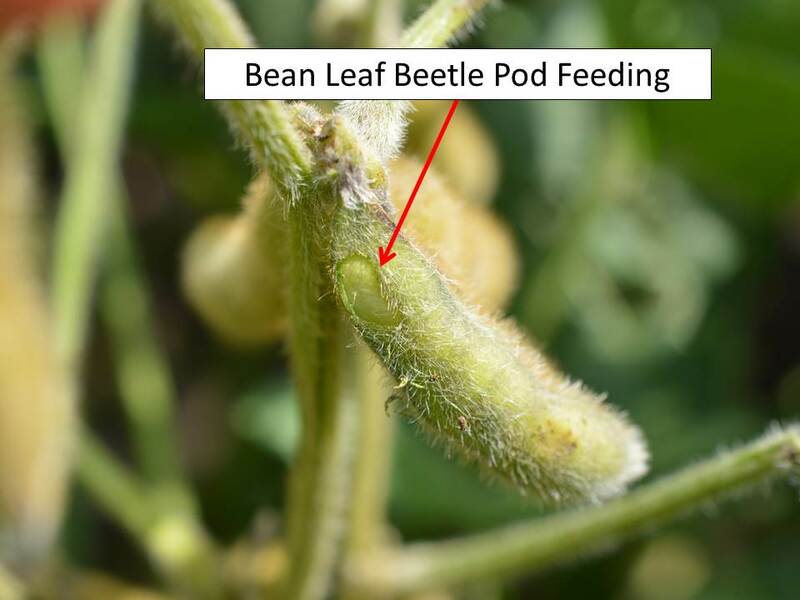 Two or three pods fed on per plant may justify control if there are still larvae in the field. 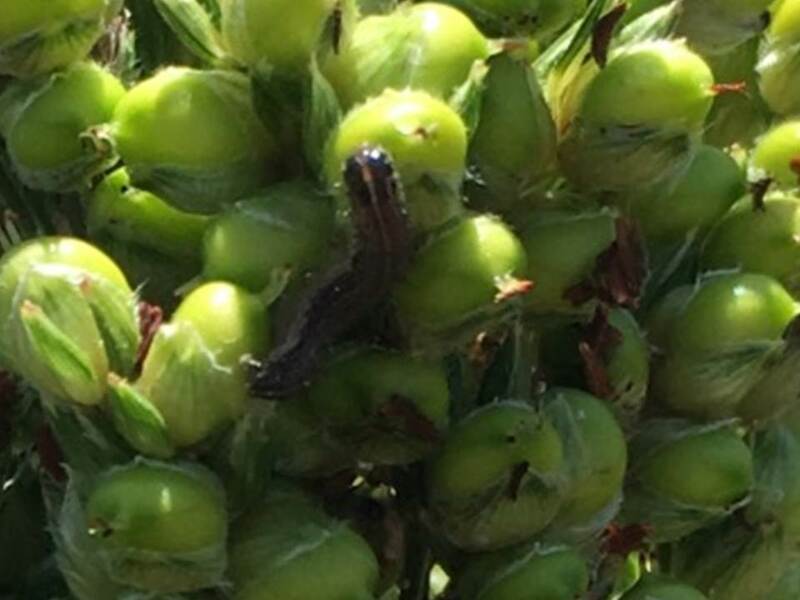 Otherwise, they may have pupated and treatment should be delayed until sampling indicates the next generation of larvae is actively feeding on seeds within pods. 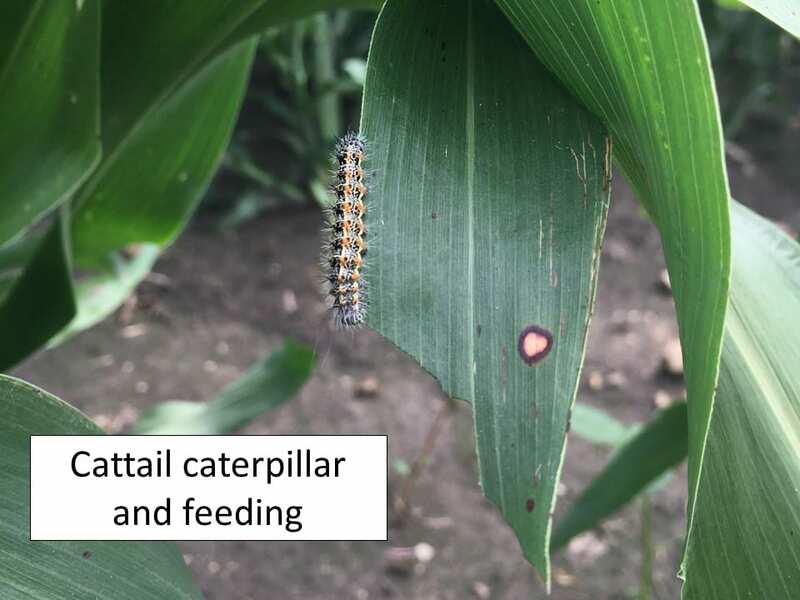 Alfalfa caterpillars are also feeding on leaves and adding to the worm variety but will not cause any detrimental impact on yield.